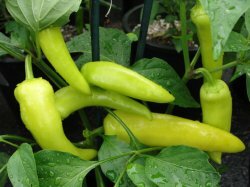 The banana pepper (also known as the yellow wax pepper or banana chili) is a member of the chili pepper family, often served pickled on sandwiches. It is a variety of the species capsicum annuum. Its shape and color resembles a banana. The flavor of this strain is sweet with no heat (0 Scoville units), and as is the case with most peppers. Banana peppers are typically yellow, but can also be orange or red. Yellow peppers are generally served pickled and tend to have a flavor similar to a vinegary sweet pickle, these have become my favorite pizza topping since it adds the perfect amount of chili pepper flavor and zip. Yummm! !